The Staff of the East Kentucky Science Center has been busy preparing to open our new exhibit “Our Weakening Web” which is now on display. Our Weakening Web is an interactive exhibit that will give visitors an inside look at how easy it is for wildlife to become endangered and possibly extinct. Travel back with the Weakening Web timeline to find out how creatures of long ago fell victim to extinction. Discover how uncontrolled development leads to destruction of wildlife habitats and puts many species in danger of not being able to survive in Getting Wildlife out of the Way. Uncover a seaside sanctuary that is out of this world, providing a safe habitat for species at Florida’s Canaveral National Sea Shore and nearby Merritt Island National Wildlife Refuge thanks to NASA and the U.S. Department of Fish and Wildlife. Our Weakening Web was funded by The National Science Foundation and designed by The Cincinnati Museum of Natural History. It is being sponsored at the East Kentucky Science Center by Equitable Resources, Olin and Muriel Prather Foundation and Chesapeake Energy. To bring a school group, your family, or just to learn for yourself what you can do to help “Our Weakening Web” call 606-889-0303 or visit us on the web at www.wedoscience.org. A new planetarium show called The Planets is now playing at East Kentucky Science Center’s Planetarium. Narrated by Kate Mulgrew of Star Trek: Voyager, The Planets promises a tour of our solar system that is as thought provoking as it is beautiful. Showings will begin on January 24th at 6:30 PM. Walk along the steep edge of the Valles Marineris, the grand canyon of Mars, fly through the rings of Saturn, and discover ice geysers on Neptunes moon, Triton, the coldest place we know of in the solar system. 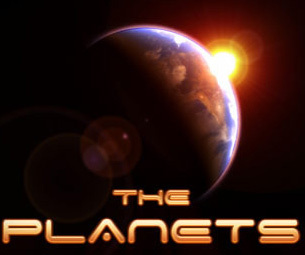 The Planets was produced by the Southeastern Planetarium Association. It was written by Jon U. Bell of Hallstrom Planetarium, Ft. Pierce, Florida, narrated by Kate Mulgrew, music and sound effects were arranged and performed by Jonn Serrie, featuring Gustav Holsts The Planets. The visual and DVD processing was undertaken by Adam Thanz and Jason Dorfman of Bays Mountain Planetarium, with additional artwork by Richard McColman of Morehead Planetarium and Deborah Mann of Bays Mountain Planetarium. Voice recording was done by Phantom Audio, and voice mastering was by Joe Lenartiene of WCQS Radio 88.9 FM, Ft. Pierce.